Have you ever wondered what it’s like to be…. A fading pop star whose memory is beginning to slip on her farewell tour. An old, cantankerous man who isn’t ready to die. A little girl who both is and isn’t exactly what she appears to be. A man living with severe food allergies who would give absolutely anything for a cure. Everyone has a story hidden deeply inside themselves, but not everyone realizes exactly what that story is whispering into their ears. A wonderful collection of tales from the heart. This is a truly special book, a compilation of highly imaginative and thoughtful short-stories. I can say with complete honesty that every one made me smile and pause for a moment to think before moving on. I look forward to reading more from Lydia. The common thread in the stories in this collection is that the author hints at things "not being quite right". You read furiously, waiting for the hammer to fall. These are the kind of writing I personally enjoy. The talent is there for certain, I can only hope there are more short stories forthcoming from this author. 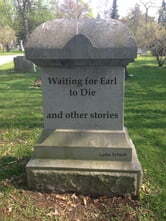 Waiting for Earl to die (and other stories) is a collection of short stories that will surprise you. Lydia tackles a few, very different, tales and brilliantly weaves her warm fluid style through them all. Once I started reading, I couldn't stop. The beautifully crafted stories grabbed me by my hand and took me on a wonderful ride that I couldn't, or wouldn't, get off. With writing like this, Lydia Schoch is going to go very far. A quick and very fun read. The stories all have clever premises and very enjoyable twist endings. The story titled "Proof" was particularly good. The only complaint would be the short length--it definitely leaves you wanting more!